scopelliti wrote: Yes, it is strange that the photos in the replies are upside down, yet display right side up when clicked. BTW these photios give a good feeling fior the incredible forces involved in a major derailment. I see one photo where one rail of a frog is just ripped away. 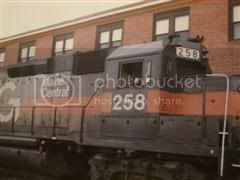 Used to live in Allegany, NY and was at a derailment site. I remember a riveted box car where one steel panel had been pulled away from the other. The rivets were still attached to the lower panel and the other panel had enlarged holes where the rivets had been! Pulled through like taffy, only thick steel! This occurs, in many cases, from cell phone photos. If flat scanned (reverse the item/photo) or from a hand held camera, one can "right" the image prior to posting, via software. The issue continues when creating a thumbnail that is correct, but the actual photo link is not, when creating it on a web page. 1. New Hyde Park Rd in the 1970's - car went around gates First photo. The article states '...the second major delay this week..." Might this be near the July 13, 1973 New Hyde Park Grade Crossing Collision when a mail truck was struck by a LIRR passenger train in New Hyde Park? OR? Any further info: date/photos/LIRR info appreciated. Thanks. scopelliti wrote: What happened to the FL9 after this "adventure"? Kelly & Kelly: The last picture in the turntable pit sports a well coiffed Tom Lally, Superintendent - Jamaica, Carol Mills -Transportation Manager, Mark Sullivan - Master Mechanic/ACMO, Kenny Schultz - Road Foreman of Engines and Pat McGowan - Road Foreman of Engines/Superintendent Engine Service. All good guys. All still with us and all retired. Nice.. When did this occur? Thank you. I was about to say when it comes to New Hyde Park, wasn't there a mail truck that was hit at New Hyde Park Road? Take a good look at the Massapequa Park photo, that occurred during the grade crossing elimination project while it was ongoing. Those two women are near a pedestrian underpass that connects Park Blvd. to the WB platform. Even though Unqua Road was closed off from vehicular traffic during the elevation, in the closing months of the project as it was wrapping up there were several train/car collisions at Park Blvd. Now I just realized the one time as a kid when my Mom got a flat tire in our Dodge Caravan and we pulled underneath the viaduct during AM Rush Hour and trains were flying over our heads. Our van had it been 25 years prior would have been on the original Park Blvd. grade crossing! I also recall that another incident at New Hyde Park occurred around 1998-2000 in which the driver was killed, and the car was pushed Westward and left unrecognizable next to the WB platform. This happened a few years after the Covert Avenue incident. Okay, since nobody responded, we shall. The FL9's departure into the turntable pit was part of a demonstration by the Training Department before a group of Engineer Trainees. It was an unplanned demonstration. A Training Specialist who later climbed pretty high in the Transportation Department's ranks was showing the class around the then-new bi-level equipment. After completing his training and failing to properly and rightfully set the hand brake, the engine rolled out into the pit. As incidents of this nature usually are, it was quite an embarrassment, and one that was never "lived down". Thing to understand with FL-9ac is they had a electric air compressor , as long as engine was in Run position with key in the Compressor ran and maintained brakes. In Idle and Key out the FL-9ac no longer had a compressor or air supply so a Handbrake was absolute must . Okay, since nobody responded, we shall. As incidents of this nature usually are, it was quite an embarrassment, and one that was never "lived down". Someone had a slide of a 1977 LIC derailment on ebay. Probably before they changed the trucks on 100-107 engines. A few employees said that caused a lot derailments with the sw1001’s early in their careers. BM6569 wrote: Someone had a slide of a 1977 LIC derailment on ebay. Someone paid $68 for that? Yeah it's crazy! But man it's a lot of fun searching LIRR slide on ebay and scrolling through all the current items for sale and sold items. So many neat shots. I saw two of the wye on the Hempstead Branch that was taken out years ago. Really cool someone thought to take a shot of it!